Conversation started 19 September 2015, 8:59 p.m.
PHIL: Hi Tao, howsit going? I’m writing to extend a casual invitation to participate in season two of Number Five Bus. The general idea for season two is to have Bus riders from season one conduct their own online conversations with people of their choosing. For example, for episode one we have Matthew Cordell talking with David Ezra Stein. I’ve been hesitant to contact you because I know you’ve got a new little one keeping you busy and I didn’t want to add any additional stress into your life. So, that said, this is just a casual invitation. Not everyone from season one is participating, so you definitely do not need to feel pressure to join in. However, if this does sound like something you’d like to do then we’d love to have you. So if this sounds like something you’d like to do then great. If not, not big deal. Just ignore this email completely. This is very exciting! But…I am going to pass. Because…it is scary. *sigh* Making conversation, especially leading conversation, is not very much my thing. I like to watch people talk and listen to people talk. Like watching TV. Except it’s not TV and we’re all in the same room and suddenly I realize how strange it may seem to everyone else that I haven’t said a word. And then I feel weird. Since you asked, it’s going very Pink Eye this weekend. How did I get it? Not sure. But not long ago I was flossing my daughter’s teeth and something flew off the floss and went straight into my eye. Mouth crud in eye. Pink Eye. Coincidence? Have you ever heard of anything so gross? Children are gross. It is so much fun to read the interviews! Sorry I am not giving back. I just take and take and take. PHIL: I expected you’d say no thanks. Rest assured this only bolsters your street cred with the Steads. I didn’t know a person could get pink eye after the 5th grade. I hope that’s sorting itself out for you. Children are gross. But still, I like them better than adults. We were in NYC all last week and 5 minutes of people-watching there proves that pretty much all people are gross, regardless of age. I’m pretty sure I got mouth crud in my eye waiting for the F train. I’m really glad I don’t live there anymore. Who knows, maybe when our careers hit rock bottom we’ll all go to Germany and become best sellers. a big, beautiful bug with wings that broke the light into many colors. So Oscar put his father into a jar, took him down to the river, and let him go. There, a fish came and tried to eat his father up. And his father flew away. Oscar took off his shoes and sat down. He let his feet dangle in the water. “What should I do now?” he asked the fish. “I would go for a swim,” said the fish. “What if I can’t swim?” asked Oscar. “Then I would go for a walk,” said the fish. Oscar let the mud squish between his toes. “Welcome,” sang a chorus of frogs. “Be happy,” said a tree full of birds. “Step carefully,” said the turtles. Then Oscar walked along their backs all the way to the sea. There, he borrowed a boat that was forgotten long ago. Oscar watched the animals move across the sky. He watched their wobbly twins reflecting on the water all around. But when Oscar woke he was not alone. “You look just like me!” said Oscar. And she did look just like Oscar—except she was a polar bear. “Why are you a polar bear?” asked Oscar. “Because I have always been a polar bear,” she said. “There is no ice here,” said Oscar. “I can help,” said Oscar. And he paddled for days and weeks and months and years until he found ice. The polar bear said, “Thank you.” And the polar bear said, “Goodbye.” And the polar bear was gone. Oscar was cold. He did not have a fur coat. “Is it better to have shoes?” he wondered. “Or not to have shoes?” He could not decide. So instead Oscar found a new problem to solve. and never once got cold. TAO: I got pink eye the first time in 8th grade. And then again as an adult in New York City. I’m sure it was from the subway. Or maybe it’s just me. Maybe I’m the one who’s gross. So then pink eye and I deserve each other. 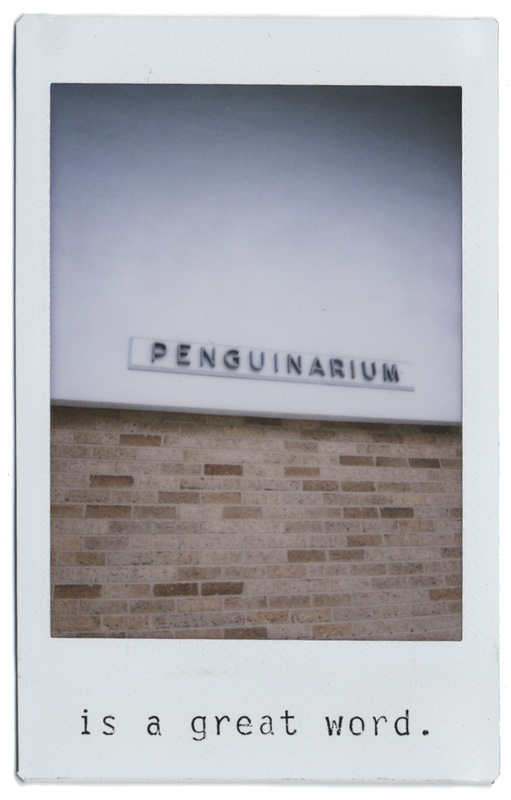 Wow, Penguinarium. It is weird. A nice weird. A mysterious weird. I take “sell in Germany” to be a compliment. When I was in illustration grad school and my husband was in business grad school he got a 1 week internship to work for some guy in Munich. So I tagged along. I wandered all around the city while he was at work and stepped into every book store. That’s when I was introduced to European Children’s Books. And I was like “Whaaaaaaaaaat???? ?” The books were lovely and weird and amazing. The art was so different and the stories seemed so different (I could only guess, not being able to understand German). I especially liked one title: Auf Wiedersehen, Herr Muffin. I think it was about a hamster who dies. I felt somewhat deprived by not having experienced these kinds of books as a child. Like my childhood eyeballs missed out on a big part of art education and my mind was not exposed to open endedness in a story. Blah blah blah. I wouldn’t mind living in Munich. The dogs are very impressive there. No one had a dog on a leash. The dogs always stopped at crosswalks and waited for their people to catch up. People would go into shops and their leash-less dogs would just sit and wait outside. Almonds! What a detail! I could write for a thousand years and never come up with a detail as perfect as that. I gotta track this book down. So how has bookmaking been going lately? Anything in the works? I finished a big project in August and now all I do is stare at my desk and remember a time when I used to have thoughts and ideas. My brain is a black hole. I expect it’ll stay that way for a while. TAO: Hmmmm, bookmaking. Well, I am working on the same project I talked about…whoa, a year ago. I finished final sketches in February before the baby was born. Then I took a break for 3 months and when I came back to the sketches to start final artwork I wasn’t too keen about them any more. And so I did a new round of sketches. And the evening I am about to email them to the art director I see I have an email from her earlier that day. She is going on sabbatical! And the editor is on maternity leave. And the other editor is also on sabbatical. And when the art director comes back I am in NY. And when I come back I say, hey what did you think of the new sketches? And she says, what new sketches? And oops, the file size was too large and she never got my email. And so on and so forth. So, new sketch ideas are approved and I am drawing final sketches to scale. I have managed to get further behind than where I was 7 months ago. So, progress is slow. Especially since I am only managing to find 1-3 hours a day to get stuff done. And I am not a speedy drawer. Something has got to change. And it can’t be the deadline. Again. Congratulations on finishing your project! If your brain is feeling black hole-ish, perhaps you could try looking for some moss. It is a surprisingly soothing and mysterious creature. I went to Kyoto to look at old temples and gardens and eat. I did not expect to come back loving moss. It was worth flying half way around the world to look at some well tended moss. But I bet there is moss in Michigan too. PHIL: We do have moss. I’ve never really given much thought though. Maybe I ought to. A very good friend of mine had an uncle who spent time at Jackson State Prison here in Michigan. When he got out all he could talk about was how amazing the moss was in the exercise yard—how incredibly soothing it was. I didn’t take that endorsement too seriously, but now that you’ve seconded the motion I’ll give it another thought. I’ll probably just look for some in my backyard and skip the whole prison thing. I would like to go to Japan though. We’re going to China in November for a book festival and I’m worried the whole trip is going to bum me out. I’ve become very allergic to people lately. From what I’m told China has a lot of people. For the last year we’ve been living on a farm in Northern Michigan where I can go days and days without seeing another person (other than Erin). I’ve realized that this suits me fine. I’m worried I’ll be ten minutes off the plane in Shanghai and my brain will explode. Guess we’ll see! So is this delayed project of yours the Kate McMullan book or the book of your own? TAO: OY, yes this project is the Kate McMullan book. My own book has been collecting dust. I put that one aside to do Kate’s book. At the time, it was good to put it aside because I was kind of stuck. Now that it’s been sooooooooo long, it will be interesting to get back at it. It’s been…years. Oh my, book tour in China! That is exciting. And yes, it’s a wee bit crowded. People there have a different take on personal space. Meaning, it doesn’t exist. I remember when I was a kid, getting on a bus (or was it a subway?) and being mashed against a sweaty man who was wearing what most men there wear – a wife beater. Good times! But that was years and years and years ago. Enjoy the food! Do you have time to go to the Yellow Mountain? It’s amazing. It makes you realize that Chinese watercolor landscapes are not abstractions at all, but super realistic. The views all around the Yellow Mountain are absolutely amazing. All you have to do, is block out the 100 people ahead of you and 100 people behind you on the trails! Ha! PHIL: Oh, hey! I thought you’d disappeared. Funny that you just wrote because Erin and I were just discussing you. I will explain in a minute. First, the Yellow Mountain! How cow, I just Googled it and you’re right. It looks like every painting I’ve sat next to while eating Chinese food. Unfortunately, I have no idea if we’re going there. In fact, I know embarrassingly little about anything that we’re doing there. All I know is that we’re going to Beijing to do I-Don’t-Know-What and Shanghai to give a presentation about I-Don’t-Know-What to I-Don’t-Know-Who at the Shanghai Book Festival. Should be fun. I very much want you to to start working on your book again. Erin’s working on a book right now that she only has 8 weeks to finish. That includes the sketching and everything. 8 weeks is about 70 weeks less than her previous record for fastest-book. At first I was skeptical, but now we’re about 6 weeks in and it looks like she might make it. On top of that it’s my favorite book she’s made so far. It turns out that the usual 60-70 weeks of doubt, regret, and self-loathing can be truncated down to about 36 hours. Food for thought. Okay, now hear me out. I know you’ve technically declined to participate in this season of Number Five Bus, but………..what if we published the contents of this conversation instead? (I promise this was not my intention all along.) It’ll probably be several more weeks before I get another completed episode from anyone, but I’d really like to post something new before we go to China. Looking back we covered some interesting territory—moss, motherhood, German fatalism, prison, Chinese watercolor landscapes. 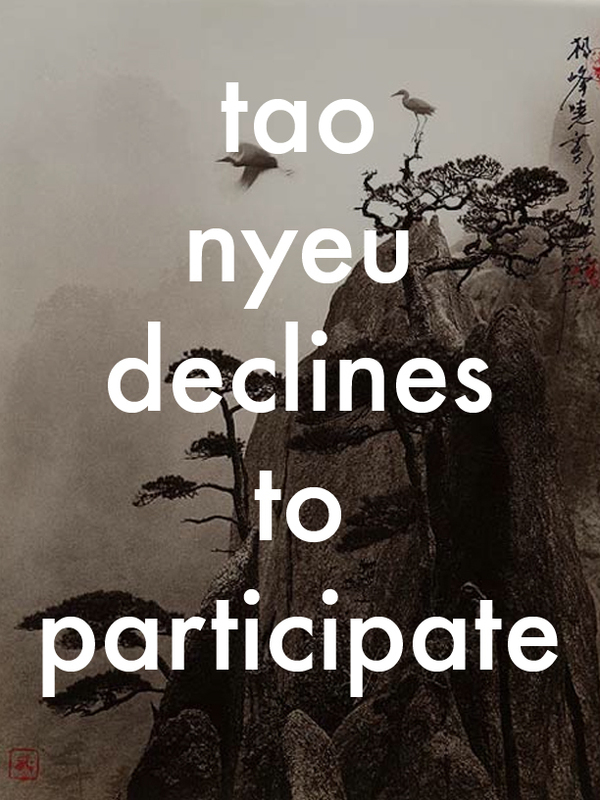 We could title the episode: Tao Nyeu Declines to Participate. Whaddya think? Say yes. TAO: Ah! I’ve been hijacked by the Bus! Ha.You guys are funny. Does anyone really want to read this? Ok, I say Yes. Only because you asked so nicely. I only ask that you edit out the OY in the last email. I don’t want anyone to think I am OY-ing Kate McMullan. The OY is about me taking so long, that I’m still working on the same project discussed over a year ago! Must go now. The wee one is hungry. Must attend to her before hungry turns into hangry. PHIL: Yay! And we probably don’t need to edit the OY since you just explained it yourself. Keep us posted on book progress. They will be worth the wait, I know. When you’re all done let’s make a book together, for real. P.S. I promise that future conversations will not be hijacked for publication! P.P.S. Here’s a photo I took at the Detroit Zoo a few years ago. Conversation ended 27 October 2015, 9:19 p.m.